1. Prayer is not a type of work because it is not active work. 2. Work is superior to prayer. 1. Work and the active life are goods and they are to be pursued in the world. 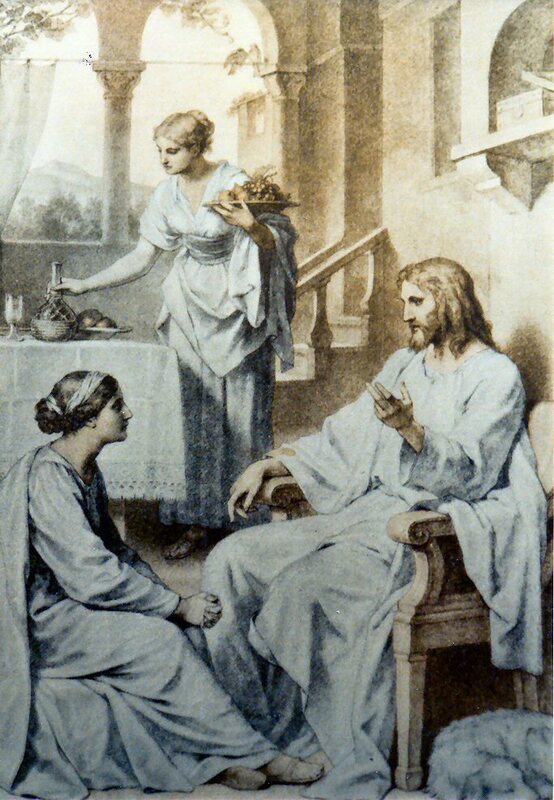 Jesus does not tell Martha that her work is bad. In fact, he presumes that Martha's work is good because he compares it with Mary's choice as something better. Christ does not say that what Martha is doing is bad. Rather, what Mary is doing is simply better. 2. Prayer and the contemplative life are superior to work and the active life because a life of prayer and contemplation has as its total focus God Himself, who is the source, beginning and end of the entire universe. The Church reveres the contemplative life so much that at the Council of Trent in the 16th century, the Church taught that a life of consecrated celibacy for the sake of the kingdom is a superior way of life. This was again affirmed at Vatican II. This is not to say that individuals who live this life are superior but it is to say that the objective state of life is superior. 3. In choosing the better part, Mary gives an example to follow. It reminds us that we need to make a place and have time for daily prayer. It is our lifeline to God. Prayer is what should animate our work. If it does not, our work is just activity - a chain of loosely connected events. Work that is not grounded in prayer loses focus, direction and real purpose. I know individuals who keep a scrap piece of paper on them with a list of the intentions for which they want to offer their work that day. It's the same for those who keep pictures of loved ones in prominent places as the reminder to pray for them and to give meaning to all of the struggles of life. Prayer is the thread that should hold our day together. 4. Prayer is a type of work - a work that begins as a grace from God and that requires our attention, our effort and our capacity to listen to God who knocks at the door of our heart daily. The temptation is to think that our activity is so essential that it can't be left alone for awhile and that we're too busy to pray. Yet our Lord tells us that only one things is necessary - prayer. At the same time, we ought not fall into the trap of thinking that our work is our prayer. Nothing can replace those precious moments we get to spend in quiet solitude with our Lord in prayer. This Gospel passage is not a call to abandon this type of prayer. In fact, we should always be on the lookout for more opportunities to engage in this kind of prayer in our day to day living. At the same time, we should also look for opportunities to integrate prayer into our work. This may mean praying the rosary while we are commuting to work or school; praying the Angelus at noon; saying grace before meals; keeping holy cards on our desk; praying before we begin our work or simple making the Sign of the Cross at the beginning of every hour to keep us recollected and by being a learning disciple by reading the Scriptures and the Catechism. This will lead us along the path to holiness - our common vocation as Christians - and it is found in our work, our study, our very lives. We must have sainthood as our life goal - it's the bottom line. All of us identify with Martha in today's Gospel because none of us is a pure contemplative. So, perhaps we need to consider if it is possible to be BOTH active AND contemplative. In other words, can we be active-contemplatives? After all, Jesus says later in the Gospel that the greatest among the disciples is the one who is the servant of all. Service implies work of some sort. So, perhaps what Martha (who represents all of us) needs to do is find a way to integrate work with the conviction that we become holy through and because of our work, not is spite of it. Thus, work should be a means, not an obstacle to fostering a closer relationship with Jesus. The goal for us is to live an integrated life - a life that pursues excellence in external work and apostolate as well as a life that desires interior piety, conversion and more knowledge of our Lord. Both the active and contemplative sides of our lives should strive to become more connected and each should complement the other. Our Lord knew work quite well. In fact, he spent the vast majority of His earthly life as a worker AND he was able to live in communion with the Father in his time as Joseph's assistant in the carpenter's shop. We should strive for no less. Like the seamless garment of Jesus which the soldiers at Calvary cast lots for because it was one single piece of valuable fabric - may our lives be ever more INTEGRATED, weaving together all the facets of our existence from things professional to things personal and from things material to things spiritual. May our lives not be simply compartmentalized - instead, may the Gospel and the power of the Holy Spirit color and guide every aspect of it. As this summer continues, when many of us take vacations and things at work "slow down" a bit, may we try to remain focused on how each day, each task presents us with an opportunity to grow closer to Jesus. May we always do our best in our work for His grater glory. On this journey to Christ, may we take solace in the words of the today's Gospel Acclamation: "Blessed are they who have kept the word with a generous heart and yield a harvest through perseverance," perseverance in both our work and spending time at the feet of Jesus. Finally, may we always venerate and appreciate the life of the contemplative nun for she already does now what we will spend the rest of our lives in heaving doing - contemplating the face of God, who will not see under the veil of a sacrament as we do in the Eucharist, but face-to-face, as He truly is.